Corinna Kneuer was born in Racine, Wisconsin on January 4, 1959. Cory attended Deerfield High School in Deerfield, Illinois, where she was a four sport star (gymnastics, track & field, badminton, and swimming). She majored in interior design at the University of Wisconsin, where she also won four Big Ten pentathlon championships. 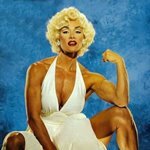 In 1982, Cory married fellow bodybuilder Jeff Everson; they divorced in 1996. She married Dr. Steve Donia, a cosmetic dentist, in 1998. Cory and her husband have one child. Cory's sister, Cameo Kneuer, is a two-time Ms. National Fitness champion. In January 1999, Cory was inducted into the Joe Weider Bodybuilding Hall of Fame. She was inducted into the Muscle Beach Venice Body Building Hall of Fame on September 5, 2005. Cory has done some acting, and her movie credits include Double Impact (1991), Natural Born Killers (1994), and Ballistic (1995). She has also made a number of TV guest appearances, most notably playing Atalanta on Hercules: The Legendary Journeys. She also hosted an exercise show on ESPN called Gotta Sweat for seven years.